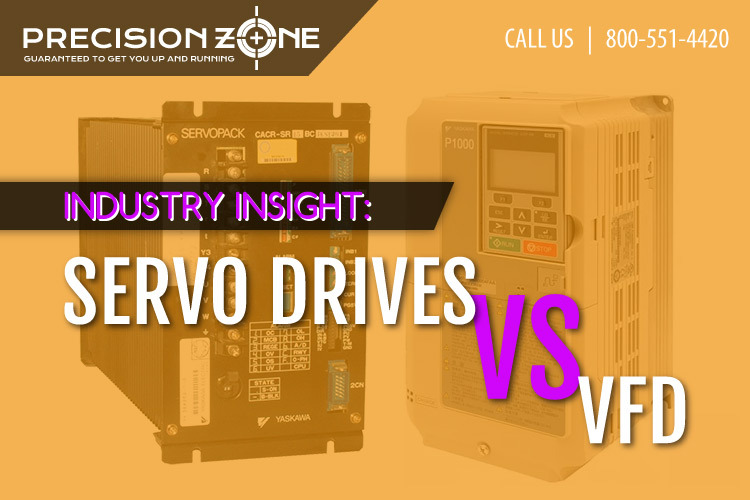 What distinguishes a servo drive from a VFD, or vice versa? A servo drive, while similar to a VFD, controls a motor most commonly utilizing an internal permanent magnet (IPM) style of a rotor. This internal magnet design allows a smaller rotor to generate a large amount of magnetic flux, resulting in increased torque and lower inertia from smaller sized rotors. With the use of an encoder or other forms of feedback unit, servo drives are able to hold precise position and calculate distances based on pulse counts. In order to appropriately keep track of this information, servo drives will generally be run in a closed-loop system, relying on the feedback unit for positioning. A VFD, or variable frequency drive, is most commonly found in use with a squirrel cage style of a motor and in an open-loop system. This style incorporates a wound rotor and stator to generate the magnetic flux opposed to the internal magnet type previously mentioned. The way a VFD is able to control the motor, by adjusting the output voltage and frequency levels, makes this drive style ideal for power-saving. A changing of speed from 100% down to 70% will allow 35% of the full power to be used. The relationship between power and speed is Power = (Speed %)³. In open-loop, an encoder or feedback device is not utilized so precise positioning cannot be obtained. Many VFDs nowadays offer the option to run in closed-loop with feedback, but the precision and repeatability still fall short of a servo drive’s capabilities. Here at Precision Zone, we deal with many different styles of servo and VFD units. Replacement options on VFD units will determine heavily on the application requirements. Voltage ratings, current ratings, torque requirements, and any sort of position control required all play a large factor when determining which drive type to use. VFDs are commonly found in applications including conveyors, pumps, blowers, and fans where the output may not always need to be the full 100% whereas a servo drive could be more of an ideal option for machining positioning and table travel distance – focusing on the positioning and precise speed control available from a servo. Yaskawa, Hitachi, and Fuji are just a few of the manufactures whose drives we are experienced with here at Precision Zone. For any questions or inquires with regard to a possible replacement drive or repair, feel free to contact us by phone 847-465-9060 or email at repair@precisionzone.com.